Piano Ex Machina is the latest instalment in award-winning London-based pianist Zubin Kanga’s piano and multimedia trilogy. Following his critically acclaimed tours of Dark Twin (2015) and Cyborg Pianist (2016, including Melbourne Festival), Kanga returns to Australia performing ground-breaking works for piano and multimedia focused on screen cultures. Video games, 80s cinema, sci-fi and internet culture and Artificial Intelligence are given humorous and darker treatment in an entertaining program that includes works and a host of premieres by some of today’s most pioneering composers in music and multimedia: Alexander Schubert, Jon Rose, Tristan Coelho, Kate Neal, Ben Carey, Adam de la Cour and Zubin Kanga. Tura will also present a short pre-concert talk by pianist Zubin Kanga with composer Ben Carey in Studio Underground at 6:45pm, before the concert at 7:30pm. Hear about how new technology, now accessible to the public, can be used within music and composing for the piano. Piano Ex Machina is the latest major international touring project by ‘cyborg pianist’, Zubin Kanga. Building on his major ‘Dark Twin’ (2015) and ‘Cyborg Pianist’ (2016) international tours, this project combines cutting-edge multimedia technology and piano virtuosity, with ground-breaking new work exploring sci-fi concepts, motion capture, artificial intelligence (AI), internet culture, interactive video and film history. Legendary composer and improviser, Jon Rose creates a wild virtuosic whirlwind of sound with a 3D hand sensor. Tristan Coelho combines film of hands building and breaking everyday objects in a funky, video game-inspired work. Kate Neal collaborates with stop-motion animator Sal Cooper to create a whimsical exploration of the kinship between cars and pianos. Ben Carey uses AI and 3D scans of objects to create a sophisticated live sound and video interaction with the piano, inspired by the flocking of starlings. Zubin Kanga creates a series of elusive multimedia portraits of friends and musical colleagues, with sound and image in counterpoint. Alexander Schubert explores the nature of internet culture, using a website to allow the audience to cocompose the work especially for each performance. And Adam de la Cour continues his wacky series of B-movie style works, this time recreating scenes from 1980s spy and action movies, with the secret agent going undercover as a cocktail pianist to infiltrate the sinister Steinway Clan. 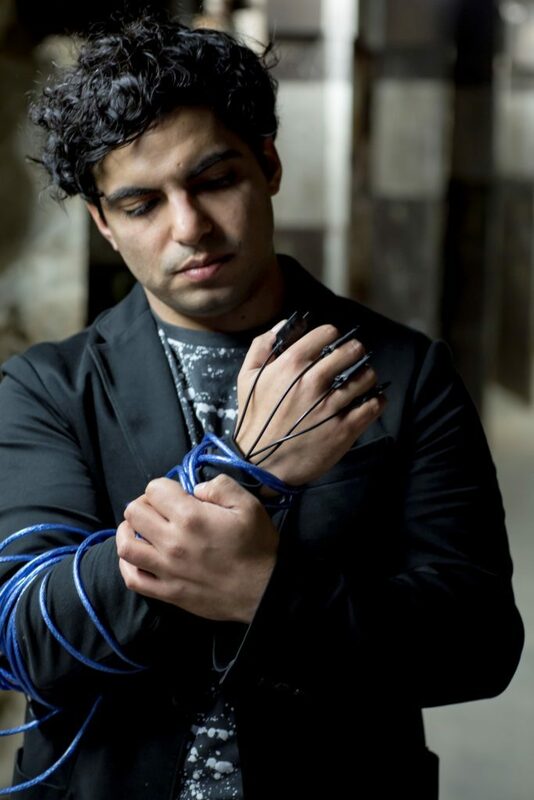 Zubin Kanga is a pianist, composer, improviser and technologist. Over the last decade he has established his reputation in Europe and Australia as a leading interpreter of contemporary works, and leading innovator of new approaches to the piano. His work in recent years has focused on new models of interaction between a live musician and new technologies, using film, AI, motion capture, 3D modelling, animation and virtual reality. Zubin has performed at many international festivals including the BBC Proms, Cheltenham Festival, London Contemporary Music Festival, Huddersfield Contemporary Music Festival (UK), ISCM World New Music Days, BIFEM, Melbourne Festival, Sydney Festival (Australia), Manifeste Festival (France) and Borealis Festival (Norway). He has performed several concerti under the composer’s baton, including with Thomas Adès and the Melbourne Symphony Orchestra and with Beat Furrer and the London Sinfonietta. Zubin has collaborated with many of the world’s leading composers including Thomas Adès, Michael Finnissy, George Benjamin, Steve Reich, Beat Furrer, Liza Lim and Michel van der Aa and premiered more than 90 new works. He is a member of Ensemble Offspring, one of Australia’s leading contemporary music ensembles, as well as a member of the Marsyas Trio, which performs across Europe, and has performed piano duos with Rolf Hind and Thomas Adès.